The RSPCA is investigating allegations that this dog fell off the back of a ute and later died from its injuries. Credit: Tahwyn Breneger/Facebook. A DOG has died after reportedly being dragged behind a ute and left for dead by the driver. The RSPCA is asking anyone with information about the dog to come forward. A post, written by Tahwyn Breneger and shared thousands of times on Facebook, claims the sharpei cross fell off the back of a white, single cab ute about 7pm January 18 on Pattison Street in Emu Park, near Yeppoon. 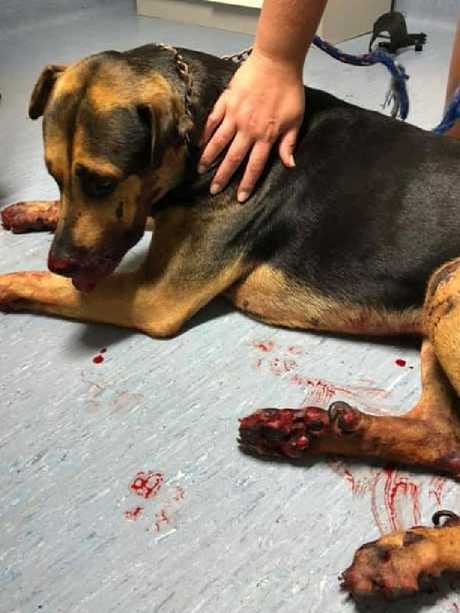 Miss Breneger, 27, of Zilzie, told The Courier-Mail the dog's lead was too long to be tied to the utility vehicle, causing the dog to be dragged behind the ute and around the block onto Granville Street. "From what witnesses said, he fell off somewhere along Pattison, out the back of Drakes supermarket's car park," she said. 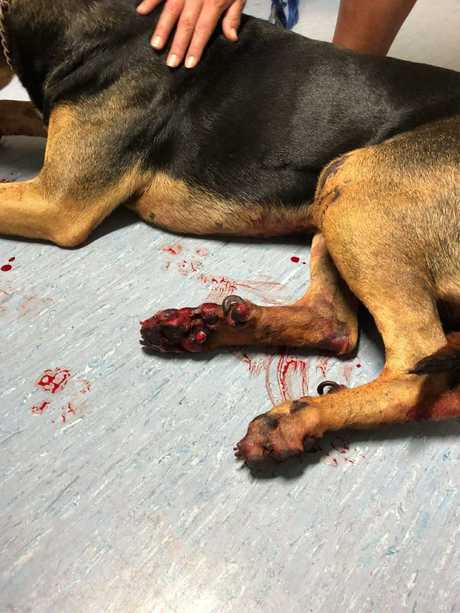 "He was dragged past the Pine Beach Hotel, around on Granville and then around onto Emu Street which is where the lead, that was attached to his chain, had snapped and the dog was left on the road. "A few quick-thinking patrons chased after the guy to let him know his dog was in trouble, to which the driver slowed down momentarily before speeding off around the corner, leaving this poor guy for dead." Miss Breneger and a friend ran to the dog to see if they could assist. "Surprisingly even after being dragged (by a choker chain) and run over several times this guy still had a lot of fight left in him," she wrote in her post. The RSPCA is investigating allegations that this dog fell off the back of a ute and later died from its injuries. Credit: Tahwyn Breneger. The supermarket nightfill manager said other witnesses told her the male had gone under the back wheel of the ute at least twice. 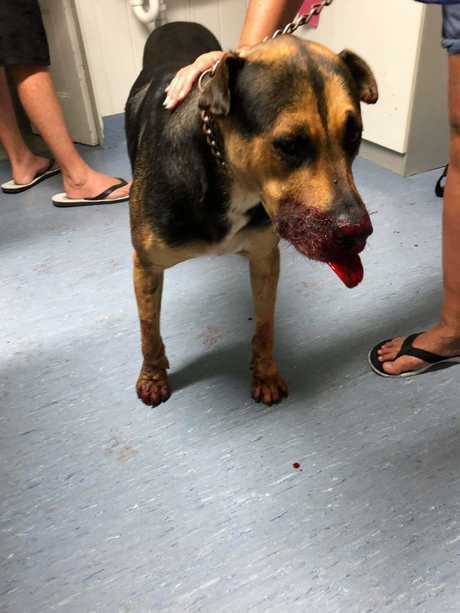 She and some other onlookers took the dog to the Acacia Veterinary Surgery in Yeppoon, where he died later that night. "The vet said that generally they can indicate age based on the teeth, but his mouth was too bloody to tell at the time as his sinuses were filled with blood," she said. "The main thing the vet mentioned when she looked over him was that he had a collapsed lung, but there was too much bruising to tell much else at the time. "The vet said he was also concussed when we arrived to the vet that night." 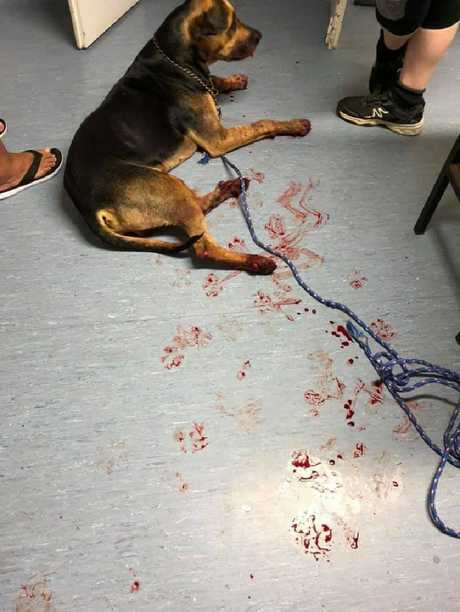 Photos show blood over the floor and on the canine's paws, legs and muzzle. The RSPCA is investigating allegations the dog fell off a ute and was left. RSPCA spokesman Michael Beatty said a report was received about the dog falling off the ute and was being investigated. "We ask anyone with further information to come forward," he said. 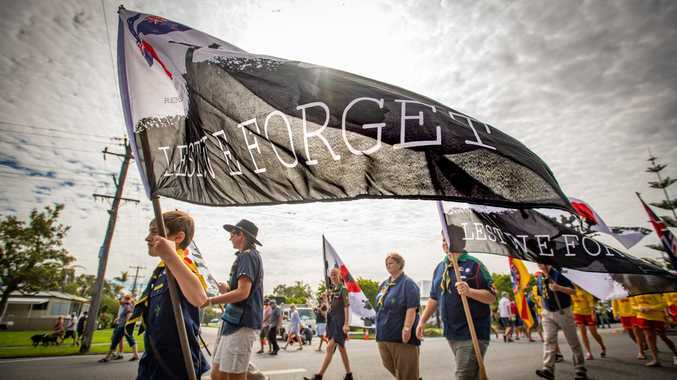 He said it was not the first time a dog that was incorrectly tied to a ute had been injured or died. "We urge people to ensure dogs are tied securely, that their tether is not too long and that they don't leave them out in the heat," he said. "That's the other thing that happens. The trays get scalding hot and the dog's feet get scorched." Ms Breneger said she wanted people to stop turning a blind eye to animal cruelty. "Enough is enough, some humans just don't deserve the love and loyalty that a dog brings into your life," she said. "The amount of pain this poor boy would have been through is unimaginable. "I decided to post this story because I am a big animal lover and what this poor dog was put through on that night is unimaginable and no pet should ever have to endure suffering and pain like that, especially not at the hands of someone they trusted and loved." 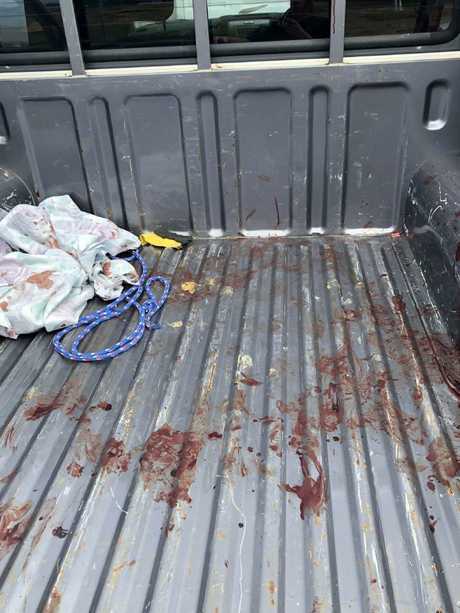 Blood from the injured dog in the back of Tahwyn Breneger's ute. 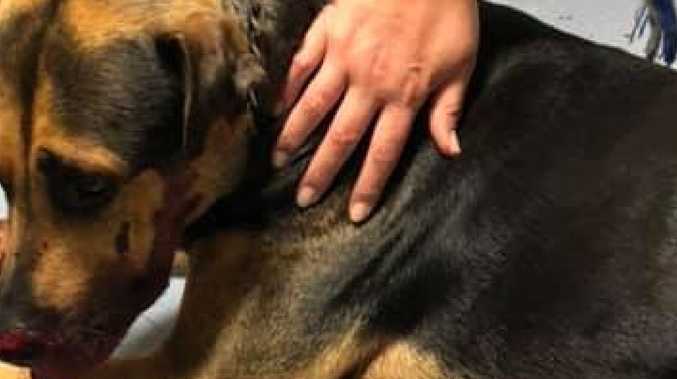 She took the dog to a vet after he allegedly fell off and was dragged behind a different ute. The unknown driver of that ute allegedly left the dog behind. The RSPCA is investigating. Credit: Tahwyn Breneger. Under the Animal Care and Protection Act 2001, people who do not ensure their dogs are secure and comfortable while in transit could be issued a fine of up to $30,000 or one year's jail. An unsecured dog on the back of a truck could also be considered an unsecured load under the Transport Operations (Road Use Management - Road Rules) Regulation 1999. It is illegal to travel with an unsecured load on the back of a vehicle, with fines of up to $2000 if not complied with. Recommendations on how to travel safely with dogs on the back of utes include putting them in crates, having them tied on a short lead, not using choker chains and ensuring they are protected from the weather. To provide any information, ring the RSPCA on 1300 852 188. ■ Has swivels at both ends to prevent it becoming entangled. ■ Avoid choker chains as they can strangle dogs when vehicles brake suddenly.